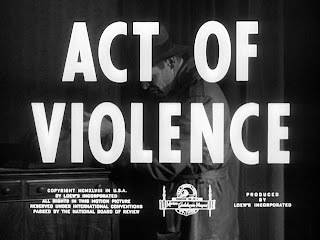 Directed by Fred Zinnemann and starring Van Heflin and Robert Ryan, Act of Violence, an underappreciated 1948 noir, is a cloudy exhale on a cold night. Looks-wise, pictures don't get too much more intoxicating. Hard shadows. Harsh lights. Careening darknesses. Zinnemann and cinematographer Robert Surtees strap us to the table and dose us up with exactly what we want. 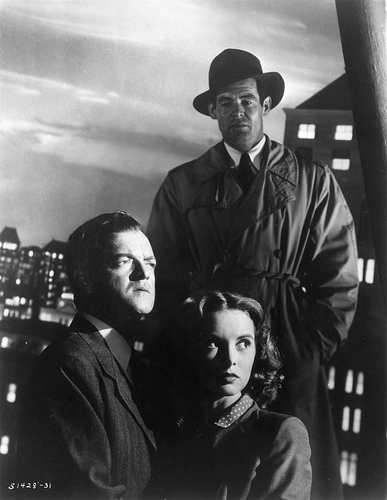 In the opening sequence, we meet Robert Ryan's Joe Parkson. 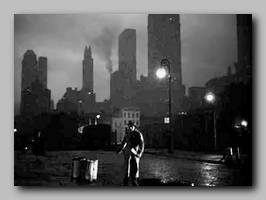 Limping out of the shadows in a rain-wet jacket, desperate, a newspaper in his hand, he disappears into an apartment building. Once inside, he goes upstairs, enters his room, and heads straight for the corner dresser. In the third drawer is a gun and a clip. He takes the gun out, inserts the clip, and stares over the barrel. For a second, we're close up on Joe's sweaty mug. He's focused, intense. And then the wonderfully sharp and simple title is splashed across the screen. Joe packs the gun in an Army bag with some clothes, goes down to the street, his leg dragging, and he gets on a Greyhound for Los Angeles. We follow him, in a series of quick cuts, on his journey across the country: angrily aware, awake in the dark as others on the bus sleep. He arrives in an idyllic California town called Santa Lisa on Memorial Day and limps into a hotel, where he gets a room and looks up a name in the phonebook: Frank Enley. It's a dark and mysterious opening, establishing just what we need to know to ratchet up the tension. Ryan's hunting, and we're frightened for the guy he's after. Van Heflin plays Frank Enley. When we meet Frank, he seems to have the works: he's a war hero with a beautiful young wife, Edith (Janet Leigh), and a cute kid. He's put on a pedestal by the folks in Santa Lisa, where he's made a name as a contractor. At the festivities for a housing project that he's had a big hand in building, Frank is praised for his service to both country and community. Grinning an aw-shucks grin, his cute kid up on his shoulders, Frank's face is full of promise and pride. He goes on stage and accepts the town's gratitude humbly. We see a close-up of Leigh's Edith, smiling, so thrilled for her husband. Next we cut to Frank hunting around for a fishing pole in a cubby under the stairs at home. He's going fishing at Redwood Lake with his pal for a couple of days. Golly gee. Edith comes down, beaming, and helps him find the pole that's hiding right in front of him. He embraces her and they stare intently into each other's eyes, genuinely in love. This brief glimpse into Frank's perfect life is deeply unsettling in the way that the beginning of David Lynch's Blue Velvet is. We know something dark is underneath it all. We know that Joe is in Santa Lisa looking for Frank. We know this perfect life will be shattered. We just don't know how or when or why exactly. Turns out it happens very quickly. Not long after Frank leaves for Redwood Lake, Joe shows up at his house. Edith doesn't think twice about letting him know that Frank's gone fishing. Joe follows him to the lake. When Frank becomes aware of Joe's presence, we see a darkness pass over his face. He turns cold and hustles back to Santa Lisa, his confused fishing pal in tow. He hides out in the house, scared, and tries to pass off that nothing's wrong with Edith. But it is. She can tell. He's waiting for Joe to come for him. Frank goes around pulling shades in the house, turning off lights. If Joe comes, he wants it to seem as though they're gone. And when Joe does finally show up, parked out in the street, Frank's paranoia goes full throttle. In a terrifying scene, Joe tries the door of the dark house, his leg dragging across the porch, as Frank and Edith huddle together inside. Our vision of Frank changes pretty quickly, too. We come to understand that Joe's hunting him for war crimes. No hero, Frank was a stool pigeon for the Nazis, sacrificing the lives of his men in exchange for food. Joe survived by faking that he was dead and he wears the betrayal in his crippled leg. He's been waiting for Frank to turn up, Frank having disappeared from the east coast years before without a trace. A small newspaper article about the “war hero” turned contractor has led Joe to Santa Lisa. Such is the way that—despite Frank's pleasant wife and sweet kid—we wind up rooting for the hunter to kill, not for the hunted to escape. But nothing's easy in Act of Violence. Frank, thinking it's best to leave his family out of it, goes to a conference in Los Angeles and is pursued by Joe. Back in Santa Lisa, Joe's girlfriend turns up to help Edith. She doesn't want Joe to be a murderer. She thinks it'll ruin him more than having to live with Frank's betrayal. Edith follows Frank to Los Angeles, and he tells her the truth about the war. He can't go to the cops about Joe. He can't risk being uncovered as a treasonous coward. Believing that Joe's girlfriend has convinced him to leave Frank alone, Edith can finally rest. But Frank knows that Joe's still hot on his heels. 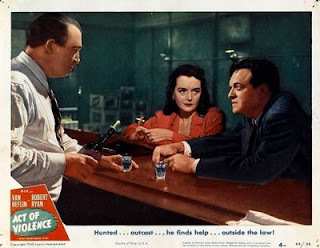 In an unexpected turn, Frank goes on the lam in Los Angeles, taking up with past-her-prime prostitute and barfly Pam (played by the stunning Mary Astor). Pam wants to help Frank but winds up inadvertently hooking him up with a hitman, Johnny (Berry Kroeger), who convinces Frank that knocking off Joe is the only way to go. On the ropes, drunk, Frank agrees. The film hurtles towards its conclusion, a showdown at the railroad station back in Santa Lisa, Joe and Johnny and Frank all converging on the same place at the same time but with different intentions. At 82 minutes, the picture is spare, without an ounce of fat around the waist. It's a punchy little hymn of cowardice and desperation. Robert Ryan's got one of the great noir faces, and he's a perfect Joe, revenge-driven yet conflicted, a hunter with heart. 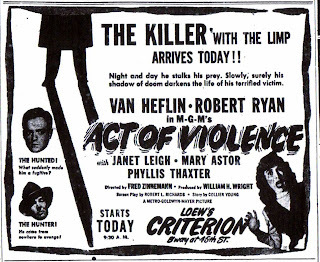 Van Heflin spends much of the film looking queasy, playing the coward with a revolting and magnetic tenderness. Leigh is aces as the tortured wife—when (or if) we feel sympathy for Frank, it's because of her and her attempts to understand his crimes. Astor turns in a weighty supporting performance as Pam, bringing a palpable sadness to the role. When she finds out what Frank's done, what he's running from, helping him is just another in a long series of failures for her. The picture's full of crosses and unexpected turns. It's portrait of small town and city—both shadowy, both perilous, both with terrible secrets—is uncompromising, and Zinnemann's direction is expert. Included in the Film Noir Classic Collection, Volume 4 (alongside other neglected gems like Crime Wave, They Live By Night, The Big Steal, Side Street, Where Danger Lives, and Tension), Act of Violence is a picture that I'd put up against the greats of the era, a stylized and frenzied exploration of conscience and chance. Bill Boyle lives in Oxford, MS. His writing has appeared in Out of the Gutter, Chiron Review, Vol. 1 Brooklyn, Plots With Guns, Thuglit, Battling Boxing Stories, Grift, and other magazines and journals. He writes about '70s crime films at Goodbye Like A Bullet.